Our tour with Made Mudana was awesome! He was very hospitable, and went above and beyond to accommodate us. We saw the beautiful rice fields, a charming healer, and were able to participate in the spiritual cleansing rituals at the spring water temple. Our guide explained to the rituals and gave us the corresponding attire. Made even took us to a wonderful place to dine for lunch. Great experience, I would highly recommend! Leave all your troubles behind and embark on a spiritual conquest for self-discovery in Bali! The journey to find healing doesn’t need to be contained in the pages of books or in big screens, have your own Eat Pray Love experience on the island of the gods when you take on a full day adventure to some of the most divine places in town. 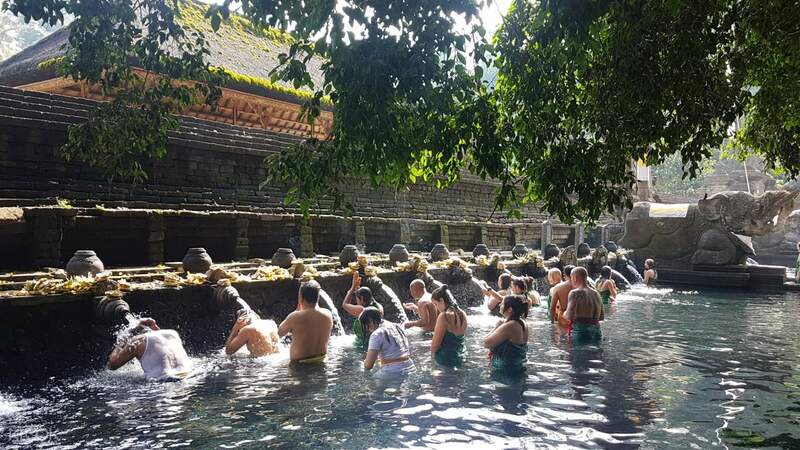 Start your quest with a trip to the Tirta Empul water temple where you will bathe in cool spring waters as a holy bathing ritual to purify your body and soul. Explore this national cultural heritage site and witness exquisite architecture dating from the old Balinese kingdom. If you’re looking to find answers to your life’s most intriguing questions then a visit to a Balinese healer may help you see the answers on a different perspective, open your heart to new possibilities, and heal some of the ailments you’ve been experiencing whether it be spiritually or physically. After a one-of-a-kind sacred ritual with the healer, cap off your tour by heading over to the Tegalalang Rice Terraces and basking in the breathtaking beauty of this UNESCO World Heritage Site. Have a hassle free whole day tour with round trip transfer services available in selected Bali areas for your ultimate convenience! And of course, always remember to eat, pray, and give lots of love on this tour. Made was a really great guide, passionate about Bali & travel and was so so incredibly informative. He helped us take photos as well when we did the bathing ritual and was very attentive. Visiting the healer was amazing and learning more about ourselves / any questions we had. Made was a really great guide, passionate about Bali & travel and was so so incredibly informative. He helped us take photos as well when we did the bathing ritual and was very attentive. Visiting the healer was amazing and learning more about ourselves / any questions we had. As a solo traveler, my tour guide Sri and our driver Yoyo made my trip very comfortable and relaxing. It was such a great experience visiting Tirtha Empul for the holy bathing ritual and to look around the whole temple. Although I wasn’t able to participate the holy bathing ritual, Sri told me a lot about the history of the place, about the ritual itself, and also about the Balinese culture. We explore more around the temple as Sri told me different stories about the place. I was able to visit the Balinese healer and as expected, they welcomed me warmly. They even served the guests some lemongrass tea while waiting for our turn. It is also amazing how accurate her palm reading was, even though I didn’t have an interaction with her prior to the activity. We also visited the Tegalalang Rice Terraces and had lunch overlooking the rice fields. It was very memorable experience for me. I recommend getting this tour if you want to know Balinese culture and for healing in all aspects. Just keep an open mind and stay positive. Thanks again for the souvenir that you gave me, the tree of life. As a solo traveler, my tour guide Sri and our driver Yoyo made my trip very comfortable and relaxing. It was such a great experience visiting Tirtha Empul for the holy bathing ritual and to look around the whole temple. Although I wasn’t able to participate the holy bathing ritual, Sri told me a lot about the history of the place, about the ritual itself, and also about the Balinese culture. We explore more around the temple as Sri told me different stories about the place. I was able to visit the Balinese healer and as expected, they welcomed me warmly. They even served the guests some lemongrass tea while waiting for our turn. It is also amazing how accurate her palm reading was, even though I didn’t have an interaction with her prior to the activity. We also visited the Tegalalang Rice Terraces and had lunch overlooking the rice fields. It was very memorable experience for me. I recommend getting this tour if you want to know Balinese culture and for healing in all aspects. Just keep an open mind and stay positive. Thanks again for the souvenir that you gave me, the tree of life. It was a wonderful experience ! Our guide / driver Made, was excellent ! He gave us so much of information on the culture of Bali. He is friendly and very humble ! Really recommend him to everyone 😬 He even gave us a little bracelet , very kind of him ! 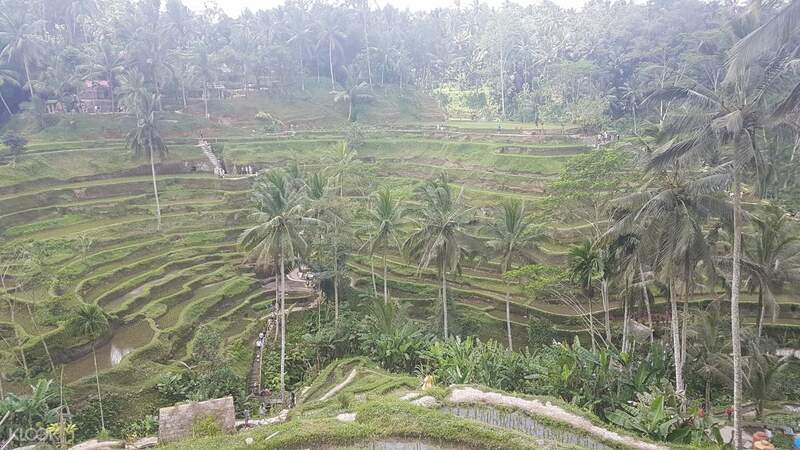 Rice Terrace was fun & Tirta Empul was amazing ! Thank you Made ! Thank you Klook ! It was a wonderful experience ! Our guide / driver Made, was excellent ! He gave us so much of information on the culture of Bali. He is friendly and very humble ! Really recommend him to everyone 😬 He even gave us a little bracelet , very kind of him ! Rice Terrace was fun & Tirta Empul was amazing ! Thank you Made ! Thank you Klook ! The tour was really good. We had the best tour guide MADE. Who explained everything about the holy bath and water temple. He was so accommodating and knowledgeable about the tour. I recommend you get him for the tour. I really enjoyed the holy bath and my trip to bali wouldnt be complete without it. The tour was really good. We had the best tour guide MADE. Who explained everything about the holy bath and water temple. He was so accommodating and knowledgeable about the tour. I recommend you get him for the tour. I really enjoyed the holy bath and my trip to bali wouldnt be complete without it. I felt like I was in safe hands as a solo traveller! My guide Made is knowledgeable and eager to share his culture to satiate your inquisitivity. Setting out early to Tirta Empul temple was a good choice as there weren't many people around and you get to enjoy the peace and serenity it offers. I was also lucky to witness a barong ceremony just after the holy bath. Lunch was scrumptious and it was an added bonus to be lunching with an inviting view of the padi fields. The trip to the Balinese healer was one that left me awe struck at how accurate his readings were. Just go with an open mind and be armed with some questions. The last stop was at the tegalalang rice terraces and it look picturesque as always. All in all, the itinerary was well planned and well paced. Definitely recommend! I felt like I was in safe hands as a solo traveller! My guide Made is knowledgeable and eager to share his culture to satiate your inquisitivity. Setting out early to Tirta Empul temple was a good choice as there weren't many people around and you get to enjoy the peace and serenity it offers. I was also lucky to witness a barong ceremony just after the holy bath. Lunch was scrumptious and it was an added bonus to be lunching with an inviting view of the padi fields. The trip to the Balinese healer was one that left me awe struck at how accurate his readings were. Just go with an open mind and be armed with some questions. The last stop was at the tegalalang rice terraces and it look picturesque as always. All in all, the itinerary was well planned and well paced. Definitely recommend! We had the BEST experience! Our guide from Bali Buddy was fantastic, good English, knowledgeable and took amazing photographs for us! We paid a bit more for a private trip and it was worth it, we spent as long as we wanted at each place. If you are staying in Ubud I would recommend that you do the trip from there, as it is a longer transfer from Seminyak area. This is one of the best day trips we have ever done! We had the BEST experience! Our guide from Bali Buddy was fantastic, good English, knowledgeable and took amazing photographs for us! We paid a bit more for a private trip and it was worth it, we spent as long as we wanted at each place. If you are staying in Ubud I would recommend that you do the trip from there, as it is a longer transfer from Seminyak area. This is one of the best day trips we have ever done! We had an amazing experience in Bali specifically with the eat pray love day trip thanks to our excellent guide Sri. She is very accommodating and she is excellent in terms of communicating the history behind the wonderful places we have visited. Excellent service from Sri as well as our driver! We had an amazing experience in Bali specifically with the eat pray love day trip thanks to our excellent guide Sri. She is very accommodating and she is excellent in terms of communicating the history behind the wonderful places we have visited. Excellent service from Sri as well as our driver! Absolutely amazing experience!! To learn about the Balinese culture first hand and get a chance to be a part of it was incredible. An then we had the best driver, who told us everything we needed to know about the culture, and escorted us around the temple while telling the story behind. Absolutely amazing experience!! To learn about the Balinese culture first hand and get a chance to be a part of it was incredible. An then we had the best driver, who told us everything we needed to know about the culture, and escorted us around the temple while telling the story behind. One of the best experience I had in Bali. Especially the holy bathing ritual at Tirta Emple Temple. And meeting the Balinese healer as well. I was amazed that what he was saying, really happened to me. My guide/driver, Wira, shared a lot about Bali's culture and religion. He guided me well, explained what and how to do the holy bathing ritual. He will make you feel safe. And took great photos too. Wira handed me this Tridatu bracelet and explained what is it for. Overall, for me this trip is AMAZING! One of the best experience I had in Bali. Especially the holy bathing ritual at Tirta Emple Temple. And meeting the Balinese healer as well. I was amazed that what he was saying, really happened to me. My guide/driver, Wira, shared a lot about Bali's culture and religion. He guided me well, explained what and how to do the holy bathing ritual. He will make you feel safe. And took great photos too. Wira handed me this Tridatu bracelet and explained what is it for. Overall, for me this trip is AMAZING! This was such an amazing experience. I loved every minute of it. Our guide was wonderful and made sure everything went smoothly. The healer we saw some excellent English and was extremely kind. This was such an amazing experience. I loved every minute of it. Our guide was wonderful and made sure everything went smoothly. The healer we saw some excellent English and was extremely kind.